While Paris-Roubaix is special for any rider that can finish the tortuous mix of tarmac, cobbled paths, dust and pain, Sunday’s race was a little more meaningful to Norwegian Gabriel Rasch, also known as Gabba, of Team Sky. Upon finishing Paris-Roubaix, he hung up his wheels as a professional bike racer and made the transition over to Sports Director at Team Sky. Here is a look into the numbers Gabba had to produce to help his team and finish the final race of his career. Rasch’s final day as a professional cyclist started off quickly. His peak 5’ Normalized Power of 352 watts came after just 20’ of racing. Early efforts like this can hurt any rider later in the race, but Rasch was riding for team leader Edvald Boassan Hagen, plus Sir Bradley Wiggins and Geraint Thomas. To view Rasch’s full TrainingPeaks file from Paris-Roubaix click here. 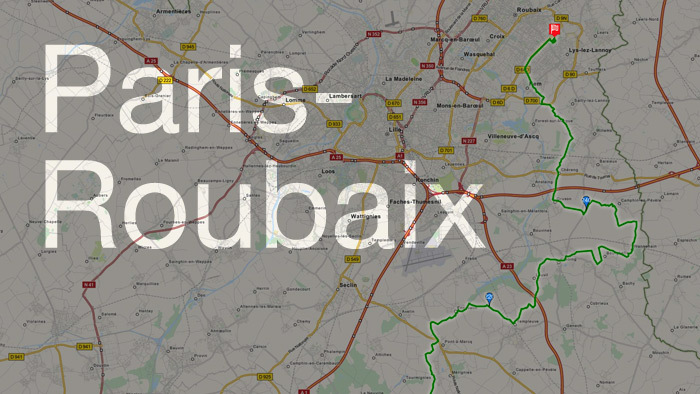 Paris-Roubaix is famous for its 28 sections of cobblestones which range in length from just 300 meters to 3.7kms. One of the most popular sections is the 18th called “The Arenberg Forest.” This section is 2.4km long and is ranked as one of the hardest by earning a 5-star rating (See rankings here by race organizers. Rasch average 264w and an average speed of 29kph (17mph)- throughout this section. As you take a look at different sections of cobbles within Rasch’s file you can see how Rasch didn’t actually produce as high of watts as you might expect. This is because of several reasons such as congestion by riders and cars as riders get flat tires or crash. Another reason why the watts are lower is because of the lack of efficiency on the cobbles themselves. It’s almost impossible to ride smoothly and efficiently as the bike bounces over centuries-old cobbles. It’s much like cyclocoss racing where skills play a big part in navigating the course rather than simply riding a straight line and powering through. Rasch’s main value to the team is working in a support role to lead-out his team leaders into the cobbled sections and make sure they get positioned well within the group prior to each section. For example, the 18-minutes prior the Arenberg Forest saw Rasch average 302w (324NP), but his job isn’t over there. He then has to survive each stretch of cobbles and then be expected to catch back up and in order to do it all over again. You can see the next 3-minutes after the Arenberg section how Rasch averaged 323w (366NP). As mentioned, there are 28 sections of cobbles and all but eight of them come in the last half of the race. This means riders have to be prepared to increase the pace in the last 130kms where the true racing begins. This increase in pace can easily be seen within the race data as the last 3hrs produced 280 Normalized Power compared the first 3hrs of the race that resulted in a Normalized Power of 269. This is despite the fact that the overall speed went down from 41.7kph(26mph) in the first 3hrs versus 37kph(22mph) in the second half due to the slower speeds on the remaining 20 sections of cobbles. In the end Rasch did what was expected of him and fought a good “Hell of the North.” He has now moved on to take a spot behind the steering wheel and will leverage experiences such as this to help the next generation of professionals.